For a while there, the running joke was that Geoffrey Meeker‘s laundry smelled like coffee. That’s because the former chef was determined to roast the perfect coffee bean with a five-pound roaster that he operated in his laundry room. And that is how French Truck Coffee was born. Based out of New Orleans, the coffee roaster and shop holds itself to high standards — sourcing its beans directly from farmers around the world, delivering the freshest roast possible, and pulling the perfect espresso every time. “The highest standard for Geoff is Blue Bottle Coffee,” says Memphis French Truck partner Jimmy Lewis. Ah, Blue Bottle Coffee. I have stood in line in Williamsburg. It was pretty darn good, even if there was a dizzying amount of beards and tattoos and scarves. Lewis came into the picture just over a year ago once he saw the potential for growth of his coffee roasting business, Relevant Roasters. After several conversations with Geoff, the two created a partnership, and a Memphis French Truck Coffee was born. “I recognized I needed help and that I wouldn’t, couldn’t, and shouldn’t do this alone,” Lewis says. Recently Lewis and Meeker have expanded from their original location on Tillman, the former Relevant Roasters shop and roastery, into the Crosstown Concourse building. Situated in the central atrium of Concourse, the shop offers one of the most interesting people-watching opportunities in the city. They also offer a tasty menu. The Waffle Sandwich with egg, prosciutto, and goat cheese is sensational ($9), and their avocado toast rivals any in the city, with red pepper and pickled red onion (one $6/two $9). They have a variety of toasts, actually, including B.N.B. — that would be bacon, Nutella, and basil (what?! ), bacon date — bacon, date, ricotta, and pistachio crumbles, and other savory and sweet choices. They import their pastries from Porcellino’s and have some specialty fizzy teas they can whip up for you. For now, food is offered until 2 p.m. Hours will expand, but first they hope to remodel their Tillman location from a roastery and cafe into just a cafe where they will offer a similar menu, making the Concourse location the primary Memphis roaster. 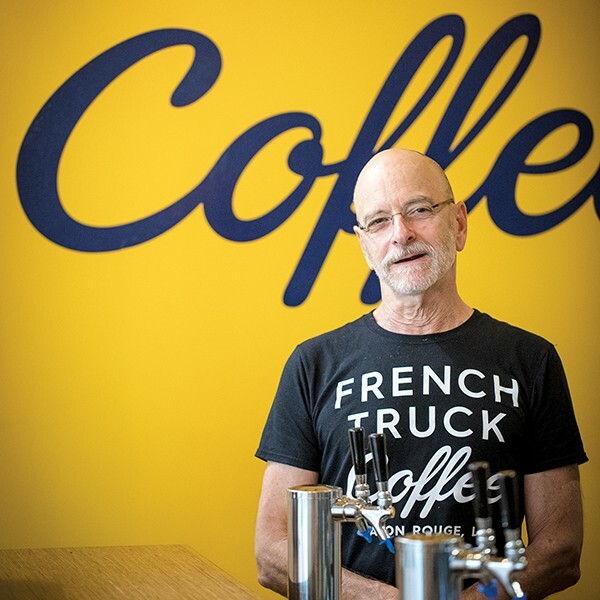 So far, there are six French Truck Coffee locations — two in Memphis, three in New Orleans, and one in Baton Rouge. French Truck Coffee, 1350 Concourse, 878-3383. Open Mon.-Fri. 7 a.m. to 6 p.m., and Sat.-Sun. 8 a.m. to 6 p.m. 584 Tillman, 458-5599. Open Mon.-Thurs., 7 a.m. to 1 p.m., Fri. 7 a.m. to 4 p.m., Sat. 8 a.m. to 4 p.m., and Sun. 9 a.m. to 2 p.m. frenchtruckcoffee.com. Part of the core mission of the Crosstown Concourse concept is to provide an environment of health to its residents and visitors, with gyms and many medical businesses setting up shop in the monolithic structure on Cleveland. So it makes sense for I Love Juice Bar to join the party. The juice, smoothie, and wellness shop will host the opening of its second location in the Concourse building, along with the block party the project is hosting for its grand debut to the community, this Saturday, August 19th. The first Memphis I Love Juice Bar opened in September 2015, bringing a menu of fresh and organic juices, wellness shots, smoothies, and clean grab-and-go foods to Midtown on Cooper. Tashie also ran Cosmic Coconut, a similar concept on Sanderlin by the Racquet Club, which he recently reimagined as City Silo Table and Pantry, a restaurant concept offering most of the same smoothies and juices, but with an expanded menu of tasty breakfast, lunch, and dinner dishes. The 800-plus square-foot space will offer some indoor seating as well as open onto the block-long “patio” of Crosstown Concourse. “It’s been a lot of fun working with the concept here with the columns inside the space, and we designed these special wooden doors to slide in when we are closed,” Tashie says. Folks can enter either from outdoors via the patio or from inside the building. Tashie says he’s excited to be a part of the Crosstown Concourse vision. “It has been cool to watch this take place, and it will be interesting to watch everyone come in and out,” Tashie says. He also thinks his product has something to offer the space. “We have a community feel at our shop in Midtown, and it will carry over here,” Tashie says. I Love Juice Bar, 1350 Concourse. Open 7 a.m. to 7 p.m., seven days a week. ilovejuicebar.com.